Today’s e-commerce spurs demand for reduced response times in fulfillment centers; generally has fewer products per order; and is constantly changing — increasing system complexity and the need for flexibility in automation. Today’s warehouses and distribution centers are far more complex than they were 10 years ago and employee turnover remains high; with complexity comes higher wages yet labor is increasingly hard to find — all adding to the equation. Businesses are making investments in a variety of technologies to improve their inventory control, order processing methods, labor situation and to enhance their pick and pack operations to be faster, less rigid, requiring less physical exertion, and achieve more accurate results. “These factors are contributing to the need to convert warehouses and distribution centers into assets for competitive differentiation. Mobility will be front and center in this shift, says VDC Research in their recent ‘Taking Advantage of Apps and App Modernization in Warehousing‘ report. Businesses of all types — from auto manufacturers to hospitals, from job shops to hotels — want to use point-to-point mobile devices instead of human messengering or towing for a variety of cost-saving reasons but mainly because it’s now achievable, cost-effective, and proven — plus there’s a real need to replace older people-dependent mobility tasks with more automated methods. Warehouse executives know that picking (grasping) still eludes robotics so they can’t buy cost-efficient robots that can pick and pack. But they also know that sensors and communication have improved to the point that navigation, collision avoidance, and low-cost mobile robots (and kits for forklifts and AGVs) can equip a warehouse with safe mobile devices that can carry or tow items from place to place thereby reducing costs and increasing productivity. Pallets, boxes and totes can be ported from point A to point B with economy and efficiency using a networked swarm of small, medium and large AMRs. Thus managers can effect economic efficiencies by cutting out wasted steps and reducing injuries and lost time through the use of point-to-point mobile robots. In a recent 193-page report by QY Research, the new autonomous mobile robots market was reported to have grossed $158 million in 2016 and is projected to reach $390 million by 2022, at a CAGR of 16.26% between 2016 and 2022. This is the most conservative of the many research reports on the subject. Tractica, a Colorado research firm with more optimistic projections and including a more expanded view of robot applications in the warehouse, recently published their Warehousing and Logistics Robots report which forecasts worldwide shipments of warehousing and logistics robots to grow from approximately 40,000 units in 2016 to 620,000 units in 2021 with estimated revenue of $22.4 billion in 2021. Tractica researched a wider audience of vendors than those cited by QY Research for their research, but neither was up-to-date with the Korean and Chinese vendors and many new startups in this space, Noticeably missing from both research reports were Asian vendors Geek+, Yujin, Quicktron and GreyOrange, startup Canvas Technology, and the nav/vision conversion kit providers Seegrid, Balyo and RoboCV. The IDTechEx report includes all of these and more. There has been much media attention – and a good lot of hype – about autonomous mobile picking robots, autonomous trucking, and last mile delivery (by land or air), yet few are delivering products in quantity or beyond the trial and error stage which is one reason why the point-to-point vendors are doing so well. There’s also news about converting AGVs, forklifts and tugs to become vision enabled and autonomous and although these adaptions are being made, those conversions are at a slower pace than those of the vendors shown below. MiR (Mobile Industrial Robots), a 2015 Danish startup, is the first mover in flexible point-to-point mobility. 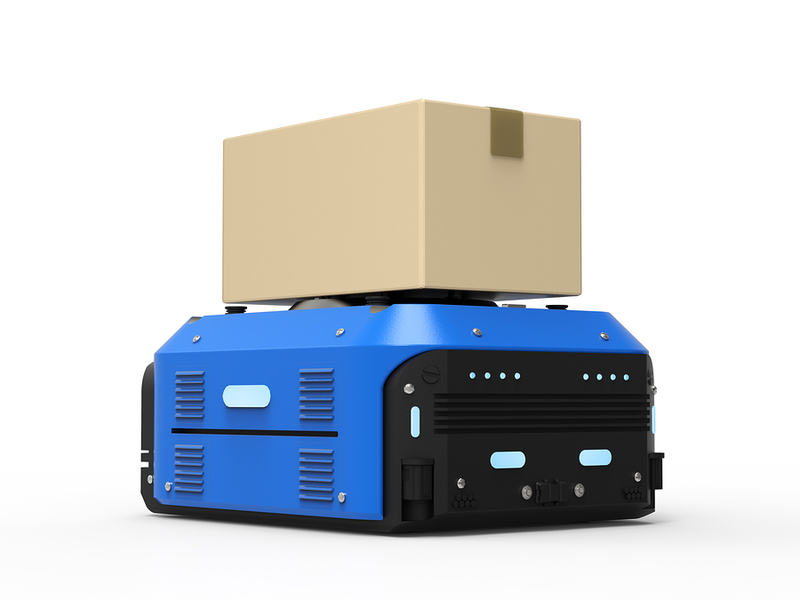 Their product line is spot on what other mobile robot manufacturers are beginning to find out from their customers: they want a bare-bones, simply-instructed, low-cost, mobile platform that can carry or tow anything anywhere. MiR’s products meet those criteria perfectly. Their towing system enables automatic pick-up and drop-off of carts carrying payloads of up to 1,100 lbs. They also provide fleet software to optimize control, coordinate orders to multiple robots, enable switch-outs when a robot must recharge itself, and provides ease of programming and integration to manufacturing and warehousing systems. In a recent press release, MiR announced that 2017 sales had tripled over 2016; 2017 unit sales exceeded 1,000 robots; employees grew to 60 and are expected to double in 2018; that MiR robots were now at work in Honeywell, Argon Medical, Kamstrup, Airbus, Flex and many other facilities all over the world; and that MiR anticipates 2018 sales to increase similarly. MiR’s rapid rise parallels the trend of businesses using point-to-point mobile devices instead of human messengering or towing. It isn’t MiR alone that is finding significant growth – other suppliers are also selling well above expectations. MiR’s rise is also being propelled by MiR CEO Thomas Visti’s use of a tried-and-true global network of distributors/integrators which he developed for the very successful co-bot manufacturer Universal Robots. MiR’s 120 distributor/reseller network covers 40 countries and has helped MiR jump-start its global sales. Swisslog, a Kuka/Midea subsidiary, has a wide and varied product line covering healthcare, warehouse and distribution centers. Their TransCar AGVs for hospitals are used as tugs and tow vehicles; their Carry Robots are used in factories and warehouses for point-to-point deliveries and to move shelves to and from pickers. Swisslog also offers extensive automated warehouse devices such as the CarryPick System and miniload cranes, pallet stacker robots, conveyor systems, and the elaborate storage system AutoStore, a top-down small parts storage and item picking system. Seegrid, co-founded in 2003 by Hans Moravec of the Robotics Institute of CMU, and funded by Giant Eagle, the big East Coast grocery chain, began with the goal to help distribution centers like Giant Eagles transform their AGVs into vision guided vehicles (VGVs). They built their own line of lifts and tugs but more recently have joint-ventured with lift manufacturers to enable them to offer Seegrid vision systems which navigate without wires, lasers, magnets, or tapes, as add-on equipment. Seegrid systems focus on the movement of full pallet loads to and from storage racks and in and out of trucks. Fetch Robotics has a catchy description for their mobile robots: VirtualConveyor robots — and they’ve partnered with DHL who helped Fetch produce a glowing video of how they are being used in a major parts resupply warehouse. Fetch, which started out as a pick and delivery system, has been quick to reorganize to take advantage of the demand for point-to-point robots including adding robots that can handle a variety of heavy payloads. Clearpath Robotics, a maker of research UGVs, and their new OTTO line of mobile transporters, have followed a similar path as Fetch: quickly adapting to market demand by producing autonomous transporters that handle heavy and light load material. They offer two stylish and well-lighted transporters for 100kg payloads and 1500kg ones plus fleet management software. Their 360° lighting system displays familiar turn signals, brake lights status lights and audible tones so it is clearly evident where the device is going. Vecna Robotics, a developer and provider of robotics and telepresence solutions for healthcare, has recently expanded into logistics with a line of general purpose mobile robots. They offer platforms, lifters, tuggers, and conversion kits so that their product line offers solution robots for the transport of pallets, cases and individual items or totes. Omron Adept, in addition to a wide range of one-armed and Delta robots, has a line of mobile platforms and transporters, plus fleet and navigation software. Adept Technologies acquired mobile robotics pioneer MobileRobots in 2010 and was itself acquired by Omron in 2015. MobileRobots sold their mobile robots to Swisslog and many others who rebranded them. Adept’s autonomous mobile robots were unlike traditional autonomously guided vehicles (AGVs). They didn’t require any facility modifications (such as floor magnets or navigational beacons) thereby saving users up to 15% in deployment costs. Amazon Robotics, Geek+, Quicktron and Grey Orange are all providers of very similar shelf-lifting robotic systems which bring those shelves to pick stations where items are selected and packed and the shelves are then returned to a dynamic free-form warehouse. Amazon has gotten the lion’s share of news because they acquired the inventor of this type of goods-to-man system from Kiva Systems and now have over 40,000 of those robots at work in Amazon fulfillment centers. But GreyOrange, Geek+ and Quicktron also have thousands of these robots deployed with many thousand more coming online all over Asia and India. They are included here because they represent an important use of mobility in fulfillment applications that as yet cannot be fully completed by picking robots. There are thousands of point-to-point operations being conducted by humans towing or pushing rolling carts in all types of businesses for all manner of purposes. Point-to-point mobile robots are popular now because they can replace those humans with simple, easy to operate devices that do the same job for less cost, hence a fast ROI. With labor costs rising, robot costs coming down, and so many gofor applications, these types of robots are no-brainers for businesses everywhere and for a long time to come.